Isabel León (b. 1974, Cáceres, Spain) currently lives in Granada. She is an artist, independent cultural manager and teacher. She holds a Bachelor in Fine Arts from the Polytechnic University (Valencia), European Erasmus Scholarship in Athens (Greece) and Valencia Polytechnic University Scholarship in La Habana (Cuba), and a Master in Art Production and Research from the Granada University (Spain). 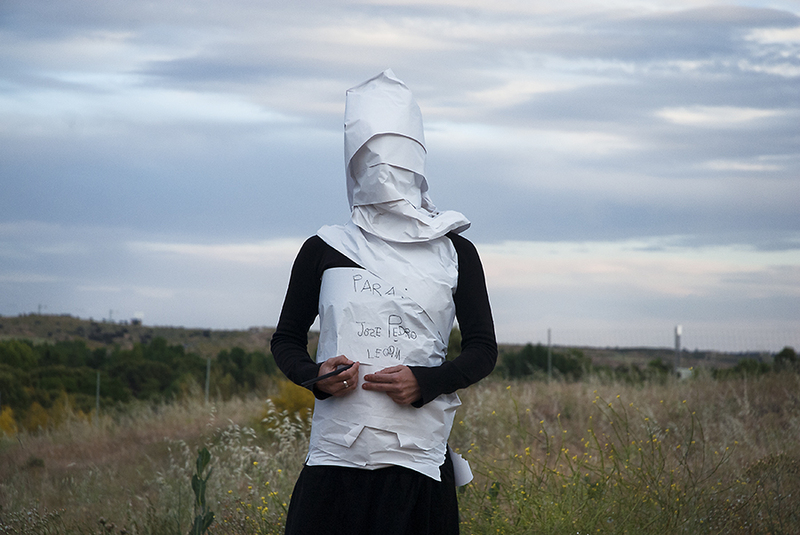 Her work has evolved from photography and video to performance art, a practice that she has been almost exclusively dedicated to since 2007, taking part in numerous performance festivals, events and residences, including Exchange Suomi (Finland, 2014), Exchange España-Norge (Oslo, 2014), Abierto de Acción (Cartagena, 2014, Jaén, 2013, Murcia 2011), Artón (2012/11), PoesiAcción! (Instituto Cervantes de Berlín, 2011), Festival Cabezabajo (Granada, 2011), NauEstruch (Barcelona, 2010), Art d ́acció (Valencia, 2010), Acción!MAD (Madrid, 2011/09), La Muga Caula (Girona, 2008/09), Sinergia (Girona, 2008). Her passion for performance art pushes her to promote the practice of performance through organizing meetings and events both locally and internationally. She combines her artistic and management activity through teaching, giving workshops in different contexts, such as art centres, universities and independent spaces. Currently she is an active member of Enclave Contemporary Creation in Granada, and she is co-founder of the project EXCHANGE Live Art with artist Ana Matey, a series of residences, laboratories and art meetings, which use action art as a research tool to investigate communication. In 2015, EXCHANGE Live Art will manifest projects in Canada and Morocco. Isabel León conceives artistic creation as an act closely linked to life, so that her works need inexorably be sincere and connected to her feelings, thoughts, deepest emotions and everyday life. She is interested in the little things, the seemingly insignificant; driving force and inspiration for her work, often linked to memory and memories, also austere in terms of technical and material needs. She is interested in performance art because its interaction with the public and how it contributes for the work to exist, making them the protagonist of her performances. She likes to play, challenges, absurdity and nonsense, causing situations or experiences that push her to dilate boundaries, feeling that she is in the midst of continuous learning and growth, both in the arts and experiential (aspects that moreover are inseparable). Currently, this learning is related to the interest in investigating the relationship between performance art and other disciplines, both artistic and from the fields of science or the humanities, running her work to shared experiences with professionals from different areas as well as artists, developing collaborative works, "exchanges" or laboratories, carrying out together wealthy projects, experiences that offers her the opportunity to play, experiment and learn.